With training from coach Darrick Ervin, my son Mark Jr. went from mid major college baseball prospect to a major league prospect. Mark lower his 60 Time from 6.7 to 6.4. Mark accepted a scholarship to play at the University of Kansas, in 2010. Then he was drafted by the Cleveland Indians. Without the help of Coach Ervin, I don't think Mark would have been drafted. I would recommend Coach Ervin's training for any player who want to reach and play at high level. As Mark get ready for spring training, he is still working with Coach Ervin's, with a goal to run 6.2 60 yard dash. I am batting over .300 in all the leagues. I have 2 home runs already this season as compared to NONE over the last 2 years!! I'm turning on 88 to 90mph fastballs whereas before I could only go to right field with pitch velocity that high!! And all this is with a combination of light and medium tension bands at only 33 swings a night!! That's why I'm anxious to step up to medium all the way around! And by fall (tournament time) I should be ready for the heavy bands or a mix of medium and heavy. "With the ET Training System, my son increased his bat speed and power to hit every college-bound pitcher with the exception of one. That LHP that threw 94mph and was drafted in the 2nd round. I highly recommend this to all ball players. 5 to 10 mph increase in bat speed shouldn't be a problem. Thank you for creating the dForce baseball training unit. I used it this spring for the 1st time in conjunction with our batting practice regimen. My players took three sets of twenty reps at three different tether tensions before taking live swings. The results were incredible. Our team batting average increased from .269 in 04, to .312 in 05. Also, I had one freshman whose bat speed was extremely slow at the beginning of the season. By the end of the year his bat speed increased over 40%. He finished the season with the highest batting average of any freshman I've ever had (.438). I plan on making it a major part of our off season workout routine. Let me know if any new baseball training systems are forthcoming. "I must tell you how the dForce Trainer has helped improve my softball game. I play on a recreation league every spring and summer. Last year I started using your trainer a few times a week with the bat and power vest. I ended the season with the best batting average on the team. The dForce trainer helped improve my timing, consistency and most of all, my power. I'm starting to work with your golf club now. If it helps me anything like the bat did, my golf league better watch out." The dForce trainer is phenomenal. At 5'6 I wasn't even touching the rim and then I started using the dForce Trainer and at 5'8 now I can dunk. All at the age of 13. The dForce Trainer helped me tremendously. Before I started using dForce Trainer, I had a very hard time throwing more than 35 yards. But after I used it, I was able to throw 38+ yards easily and consistently. As a high school freshman quarterback and sprinter, I can see that with the help of the dForce Trainer, as a senior athlete, I will be awesome. The dForce Trainer is an amazing training machine. My son is a high school freshman football quarterback and he is a sprinter on his track team. After purchasing the dForce Trainer, I have noticed amazing and immediate results in both his ability to throw the football for more distance and since using the dForce Trainer, his sprint times have dropped so much that he was selected to compete in varsity sprint heats as a freshman. The ET Training System has added 10 to 15 yards of distance per club in my bag. This has happened because of an increase in flexibility with the training program. This increase in flexibility also helps in strengthening my back muscles. I also like how the training program can not only increase the distance you hit the golf ball, but help with hitting the ball straighter. The ET Training System can help with other sports besides golf and can help with rehabilitation for athletic injuries. "The dForce Trainer has helped me build great muscle memory, it is also easy and convenient to use. I am hitting the ball longer and straighter. Even if I miss hit a shot the ball still stays in play. It has helped me shave about 10 strokes from my score. I would recommend it to anyone who is serious about improving their game." Your training aids serve two purposes. They improve strength, flexibility and that translates into improving your golf swing. You need strength and flexibility to have a good golf swing. These training aids do that very well. You do that and you don’t have to go and hit a lot of balls either. I work on that and when I get ready to play and I know I’m not going to have time to hit a ball, I can go right to the first tee and hit balls. These training aids are great for preparation. The dForce Trainer has increased my flexibility, strength and muscle memory for my golf swing. It is a great training tool for the average weekend golfer as well as the serious professional. The added 10-15 yards in distance has been a blessing and the accuracy is even better. The dForce Trainer has taught me the true meaning of what the golf swing is all about. The resistance bands gives me immediate feedback of the dynamics of my entire swing. The dForce Trainer allows me to work on my entire golf swing while in the privacy of my home. This is a great time saver, while obtaining a great golf work for increasing flexibility, strength and muscle memory for my golf swing. I must congratulate you for your invention of the dForce Trainer for golfers. The isometrics exercises that target hip rotation have been a blessing for me. I now can turn, almost like in a barrel - like Ben Hogan, and feel the stability of my coil and uncoiling of my lower body. I use to have the feeling of a sway and the club moving me rather than vice versa. I hit the ball more in the center of the club face and I get the maximum distance of my drives with my 90 mph swing speed. Thank you for this invaluable training aid. Hopefully, one day soon you can introduce the entire golfing world to this training aid on the Golf Channel. Your dForce Trainer training aid is AWESOME. In 8 weeks, I went from grabbing an 8 foot rim to grabbing a 9 foot rim. I can now dunk at 8.5 feet. I am 14 and only 5 feet tall. Over the past three months, the ET Training Systems training program has helped me accomplish goals I never though I could achieve. It allowed me to sculpt my body and go through a cutting process, without depleting my strength at all, in fact my overall strength actually increased! I would highly recommend the training program for anyone trying to keep up with sports fitness, personal goals, or anyone simply trying to look good. I have been interested in building muscle since middle school, since I have been average height and below average weight my entire life. In early high school I started weight lifting, achieving some decent gains at first. However, never having played a sport, I had no instructor and proved to be a danger to myself. It wasn’t long before I turned to calisthenics. Until four months ago, I noticed that my strength gains had plateau for some time, because I didn’t know that strength gains begin to converge with repeated very-high rep workouts, such as pushup. I purchased the power, bulk and speed program in May, at which point my maximum bench press was roughly 185 lbs. I wished to vastly improve my strength without greatly increasing my weight, and a workout was customized for me that increased my maximum bench press to roughly 220 lbs. I have also only gained three pounds, so that I weigh 143 lbs now, putting my maximum bench press nearly eighty pounds over my body weight! 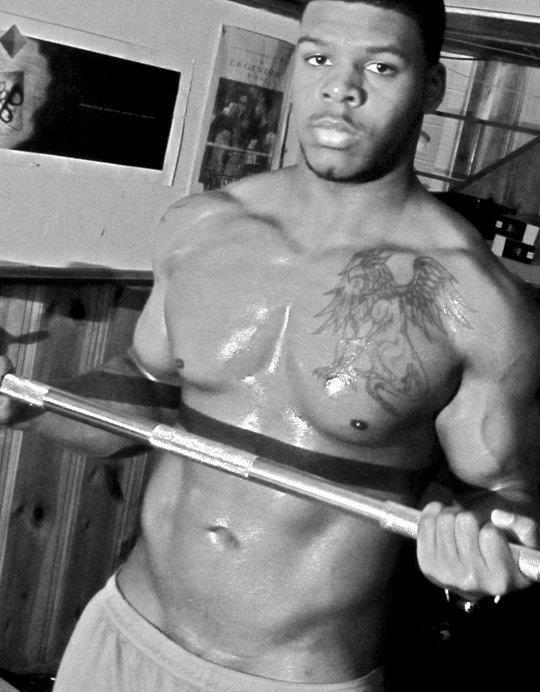 Mr. Ervin’s program is based on well-researched facts and years of experience in the gym. He is also very honest and willing to answer any questions regarding whatever the customers’ goals might be. One thing I appreciate most is the fact that when I injured myself by severely over-working (against his warnings), he coached me into a speedy recovery. Interestingly, had I stuck to his advice the whole time, my max bench would be eight weeks ahead of what it is now, at a stunning 230-235 pounds-which is far more than impressive for a 143-pound math and physics major who hasn’t played a sport since 4th grade soccer. The program has my full support. The most tremendous thing about the machine is that upon demonstration, an undetected weakness in my son's right knee was exposed from an injury that he received while playing football. Thanks to the dForce Trainer, my son's knee is now much stronger which allows him to compete safely at a high level of competition. My name is James Bowles, I own and operate a company called Minor League Sports where we train varsity athletes. I had one of my college fast-pitch softball players try the dForce Trainer. She could tell from the little time she spent on it that her bat speed had pick up. I do recommend this equipment. I was trained by Darrick Ervin of ET Training Systems from May to August (2012), 2 times a week utilizing there sport specific training aid the dForce Trainer combined with his speed training process and his do yourself Power, Bulk and Speed program for superior muscles development. I gain 8 pounds of muscles and decrease my 40 yard dash time by .42 second. No other trainer or training device that I used compares to Coach Ervin workout or the dForce Trainer. I used other trainers and devices, this include the Vertimax and did not get these type of results. The most interesting part all this, he guarantee me that if I had the desirer, work ethic and heart, he would get me there. Thanks Coach. Last track season we implemented the Sprint training work-out that we got from ET Training Systems. My son Ian saw big improvements in his 100 and 200 meter times. This allowed him to qualify for the state meet by running a 10.8 in the 100 meters while setting personal records in both the 100 & 200. This is a detailed work-out that provided us with everything we needed to do a step by step work out. I plan on using this with my younger sons as well. The dForce Trainer is phenomenal. I gained amazing speed and endurance during the track season by using the dForce Trainer. This enable me to become the first person to win 3 running events in a CYO championship meet. I came out with championships for the 400, 100 and 200 meter dashes. During my last track season, I also ran a 5.8 seconds 50 meter dash which was a new middle school record. All at the age of 13. The dForce Trainer helped me tremendously. The dForce Trainer helped me with my track performance. I used to run a 12.8 in the 100-meter dash and 26.0 in the 200-meter dash. After I used the dForce Trainer, my times dropped dramatically (to 11.9 in the 100-meter dash, to 24 in the 200-meter dash). As a high school freshman quarterback and sprinter, I can see that with the help of the dForce trainer, as a senior athlete, I will be awesome. I have an athlete in the 11th grade going to 12th he has never played any sports in his life, he started running cc in the fall of 2005 and ran some indoor season. His first outdoor meet he ran 1min,18sec in the 400 meters in April, by the end of May he ran 59sec flat. We purchase the dForce Trainer in march of 05. The d Force Trainer is one of the best training systems on the market. It improved my all around athleticism. It made me stronger, faster, and improved my endurance. I started using the d Force at the beginning of the indoor track season. Around that time, I was maxing no more than 285 pounds squatting and didn't have the explosiveness I needed to run my races. I was running 24.4 in the 200 and 11.5 in the 100. My coach added the d Force Trainer into our workouts. After using it for a couple of months, I saw a drastic change around the middle of April. I went from maxing 285 pounds in squatting to 450 pounds, and running 24.4(in the 200) and 11.5 (in the 100), to 22.2 and 10.7. For my first track season I think the d Force helped tremendously. I'm still going to use it at the college level, and would recommend it for any athlete. Just wanted to thank you for the "Its All About Weight Loss & Body Toning" book. I lost 20-lbs in 2 1/2 weeks by following your program and with a simple work out program. The Colon Cleaning program was awesome and I feel much lighter on my feet.